I was commissioned by International Art Consultants to make a large collection of work for the new Barclays Headquarters in Canary Wharf, London. I photographed views across Canary Wharf from the tops of the new building and other buildings on the Canary Wharf estate and from various vantage points around the estate looking back towards the Barclays building. A total of 36 pieces were made over a period of four months which now hang in the Barclays Building. "We first started promoting and placing Dominic Pote's work in 2002. On seeing his photographs the first word that sprung to mind was 'originality' - both in terms of subject matter, shape, and above all execution. A lot of photographers work just in black and white, and that suits them and what they want to achieve. The same can be said of Dominic Pote's softly coloured and hazy landscapes - so subtly right for what he is trying to achieve. And the list of his corporate collectors is too long to take up space here - but they must all agree with what we saw in his work. Perhaps of all his collectors, Barclays Bank provided the most exciting opportunity for him, commissioning from him over 30 works, all mounted on aluminium (with no glass or frame) for their world headquarters in London's Dockands. We are proud to be associated with such a talented and unique artist." 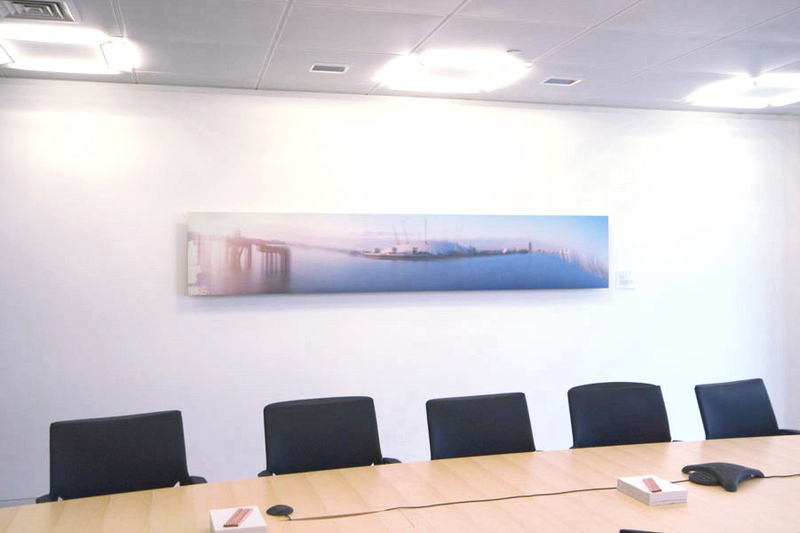 “I worked closely with Dominic in 2004-5 when he was commissioned to produce a number of large panoramic images for use in the client meeting rooms of Barclays global headquarters. His work is perfectly suited to a corporate setting. As one colleague described, “like painting with light”.